Ah, Spring. The buds are blooming, the birds are singing and the internet musters its comic might for the information prankfest that is April Fool’s. Alan Bailward over at Ufies.org has found a collection of April Fool’s pranks on Reddit and Tumblr. Here’s a collection of our favorites. Thinkgeek always puts on the best show for April Fool’s, but you’ve got to wonder if it isn’t just a test-bed for their concept gag gift products. Yeah, you’re not likely to get donuts from a Keurig coffee maker, but a techno-mage hoodie is likely to be a standard accessory for any woodlands LARP session. 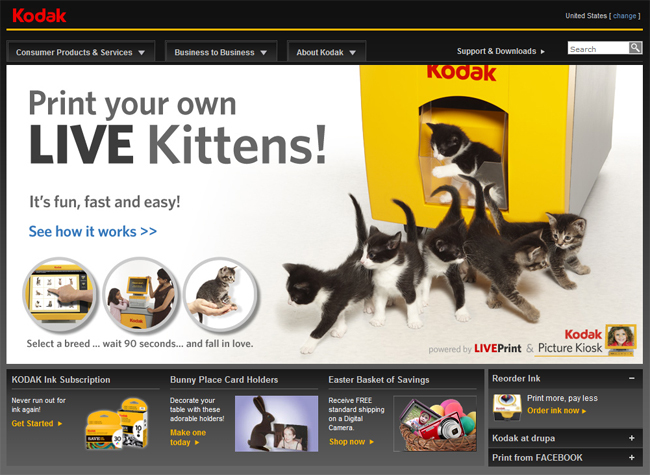 This makes me feel bad that Kodak’s going broke. I was wondering when they were going to come out with the new Rock Band. Introducing Mojang’s new game with completely original game with a name that no one’s going to sue over! Now, how’s Notch going to settle for the name this time? I know! Baldur’s Gate Enhanced Edition Speedrun Competition!